But what are they? 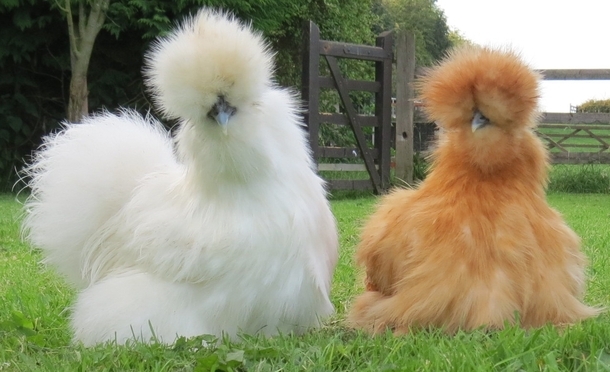 Are they chickens? Are they rabbits? Or are they nisht a hen, nisht a hare? 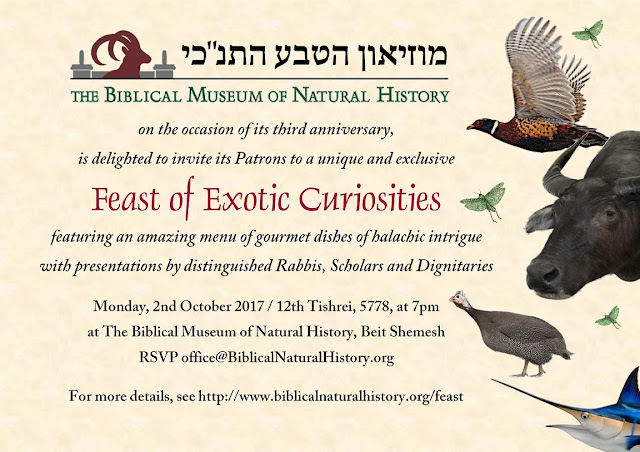 And are they kosher, and will they be served at next week's Feast Of Exotic Curiosities? Is it a sin to kill a Muppet-bird? Stay tuned to find out! The previous post, renamed to "Daas Torah is in the Eye of the Beholder," received over 10,000 views. While the response was mostly positive, many people did not like it, including some near and dear to me. I would like to clarify some aspects of it, and discuss some other things. 1) The target of the post was not Rav Chaim Kanievsky. It was the cultural phenomenon surrounding Rav Chaim Kanievsky, whereby people taking two words of blessing, or a signature, to mean much, much more than Rav Chaim ever intended them to mean. The guilty parties are the media, the tzedakah campaigns, and many of the general public. 3) "B-b-b-but Daas Torah!" See Rav Aharon Lichtenstein's superb presentation on this topic, translated into English and downloadable at this link. 4) "B-b-b-but erev Rosh Hashanah!" Things are either right to say or wrong. If wrong, they should never be said. If right, they can be said at any time. The reason was I was particularly motivated to write that post at that time was as stated - that I was terribly upset to hear about someone who, according to what I was told, is going to Rav Chaim for a major medical decision. When it comes to giving tzedakah to the poor, one is likewise confronted with an array of causes. Some of them fundraise by offering incentives - that various "Holy Men" will pray for you (or at least will have your name in a book on their table), that you will merit miracles, etc. I have seen advertisements where the entirety of the advertisement is about what you will get, not what you are giving to! As previously, I would like to recommend Lemaan Achai as a wonderful charity for helping the poor. Their focus is on using an array of professional services and aid to help people attain financial independence. Just take a look at the incredible success stories on their webpage! To quote Rambam: "The greatest level, above which there is no greater, is to support the poor person by endowing him with a gift or loan, or entering into a partnership with him, or finding employment for him, in order to strengthen his hand until he need no longer be dependent upon others." There is no smarter way to give tzedakah! 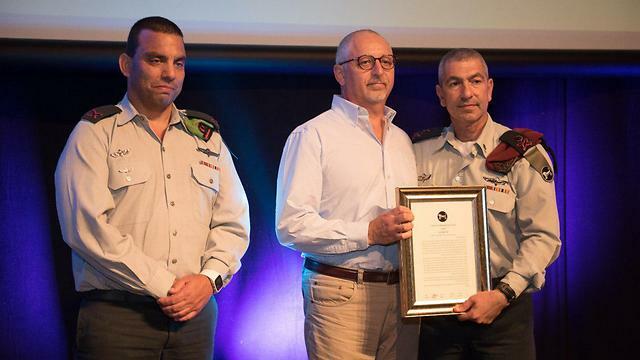 As we end the year 5777, my brother-in-law and nephew were honored today in a special ceremony for their incredibly brave and smart actions in Neve Tzuf. But they are not rejoicing in this honor, for although they saved many lives, there were those that they were too late to save. May the coming year be one of health and peace for all. I was deeply distressed to discover recently that someone that I used to know is suffering from a very serious illness. It was further told to me that the person has to make a choice between two radically different courses of action to deal with this illness. It's a very difficult decision to make, with significant pros and cons on each side. 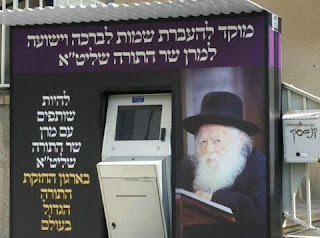 So the person has decided to ask Rav Chaim Kanievsky. 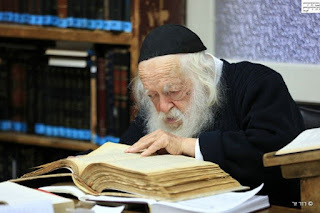 Rav Chaim Kanievsky is 89 years old. He has spent virtually his whole life insulated from the outside world. He is a selfless person who has dedicated his entire life to the study of Torah (apart from a very brief period during the War of Independence when he served on guard duty). Many people, following the contemporary charedi notion of Daas Torah (in which the less a person knows about the world, the purer is his wisdom), believe that this makes him uniquely suited to give guidance. Guessing by the radiant smile on the man who emerged from behind the white wooden door, one might think that he had just won the lottery in the tiny apartment. Moments before (emphasis added - N.S. ), he stood at the head of the line, conversing on the cell phone — probably with a worried wife — about every minute and a half. Posture bent, overwhelmed by the pressing concerns he did not share with fellow visitors, he conducted simulations, finalizing a presentation of the question, and promised his family — bli neder, of course — that he would present all of the arguments, both for and against, and that he would remember to mention Shoshke bas Mindel, desperately in need of a shidduch. Upon emerging from the inner sanctum, he wears the look of a man relieved of a heavy load. “We have a yeshivah!” he hisses into the phone. The crowded conditions in the corridor, and the brotherly atmosphere that characterizes the local citizenry, turn his whispered words into public fodder. “What did Rav Chaim say?” someone asks. In this story, Rav Chaim did nothing at all other than offer two words of blessing. Yet the questioner read into that as being a weighed-up decision as to which yeshivah his son should attend! 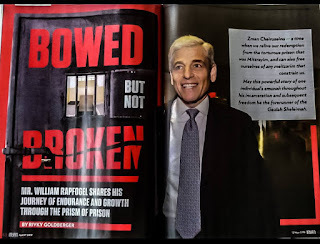 And the magazine printed this story as an example of Rav Chaim's wisdom! Last week there was another example of this, and it's on video for everyone to see. Someone went to Rav Chaim and told him that there is a deadly storm headed for Miami, of a kind that has killed many people. They asked: Should people flee? And he replied: Sakanah! ("There's a danger!"). And that was the end of the conversation. This brief interaction is viewed very differently by different people. Some people genuinely see it as a demonstration of Divine Daas Torah. "Rav Chaim Kanievsky has ordered people to evacuate Miami!" Others see it as a tragic example of nothingness. He was told that there is a life-threatening danger, so he said that it's dangerous. You can get the same answer from a five-year-old. Is there any way to prove to people that Rav Chaim's answers are not worth what these people think they are worth? Actually, there is. Or at least, there ought to be; the following two instances should prove it to anyone with a modicum of intellectual honesty. One was the well-publicized case of Rav Chaim pronouncing a berachah, with Shem u'Malchus, on a king. Except that the person was not a king at all, and was simply a fraudster. Anyone with critical thinking skills (or access to Google) could have figured that out in less than a minute. The second, and much more serious, instance was when Rav Chaim signed a letter attesting to the righteousness of Elior Chen - the worst child abuser in the history of Israel. Perhaps even more disturbingly, when a neighbor of mine asked him why he signed such a letter, Rav Chaim absolved himself of all responsibility and authority, saying that he signed because his rabbonim signed. I am sure that Rav Chaim's blessings can be a wonderful placebo for many people and are psychologically reassuring for them. But it's a tragedy that people see him as providing meaningful guidance on important life decisions. 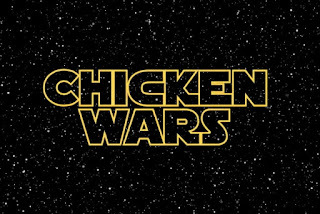 In Chicken Wars II: The Empire Strikes Back, I argued that a significant amount of the allegedly halachic opposition to the Braekel is because the Braekel Alliance is trying to bring down the entire poultry empire by claiming that the Braekel clones are the only kosher chickens and that everyone else's chickens are as treife as rats. And the empire is responding in kind, striking back with the claim that not only is the Braekel not the only kosher chicken - it isn't a kosher chicken at all. Informed sources told Hamodia that some supporters of the project were still hoping that a way could be found to accomplish the original goal of providing Klal Yisrael with a purer chicken. Though they declined to go into details, they said it was possible that by making some changes to their plans, they could gain the approval of those currently prohibiting the Braekel. Whether this proves to be feasible remains to be seen. Now, if the opposition to Braekel is that the Braekel is a treife-as-rats bird, then how on earth could "making some changes to their plans" result in it being acceptable?! It's clear that the "changes to the plans" refers to walking back their claims that everyone else's chickens are treife-as-rats. What goes around, comes around. The situation will be balanced, but in which way? Will calmer minds prevail? Or will there be an irreversible rift, with each group refusing to eat chickens (and perhaps any food) from the other side? Time will tell. Meanwhile, all this has inspired me to add a new course to The Feast Of Exotic Curiosities - "Treife as Rats" chicken soup, made with all different kinds of allegedly "treife" chickens! 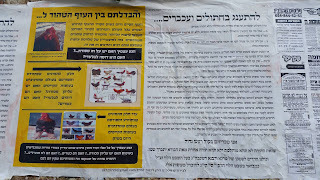 Episode III of Chicken Wars: Over Shabbos, I had the dubious pleasure of reading through the kuntrus/manifesto put out by Mesoras Taharas Ohfos (a.k.a. the Braekel Alliance, formed of representatives from the Wosner and Karelitz families, along with others) - the group claiming that all the chickens being sold over the last few decades, from bantam to Brahma, are not kosher, and that everyone has to buy the newly-rediscovered Braekel variety (at a premium price). It's clear that the Braekel Alliance have invested enormous resources into all this. They've been working on this for years - sending people all over the world for research and specimen acquisition, raising vast flocks of Braekels, recruiting support. (The rabbinic letters included in the manifesto calls on everybody to respect the Braekel Alliance's monopoly on the only kosher chicken for at least fifteen years!) Still, it's also clear that their logic is deeply, deeply flawed. 1) There are many thousands of minim of birds, including hundreds of minim of chickens. 2) Most types of birds are not kosher (for which they name "the Rishonim on Chullin" as a source). 3) The chickens that have been commercially sold for the last few decades were developed with unknown types of unknown lineages. - Hence, it is overwhelmingly likely that commercial chickens are not kosher. Point 1 is false. Point 2 is likely not to be true. Point 3 is technically true but highly misleading. 1) There are many thousands of species of birds. But there are very few minim. (See my post Chicken Shtick.) And with chickens, there are only four species (in the Gallus genus) and almost certainly only one min. 2) The Gemara (Chullin 63b) says that there are more kosher birds than non-kosher. The Rishonim raise the question that if so, why can't one rely on that for eating eggs of unknown origin? Various answers are given. Some Rishonim say that actually there are more sub-types, or more individuals, of non-kosher birds. But Ramban and Ran stay with the straightforward meaning of the Gemara and give other reasons as to why one can't eat unfamiliar eggs. And Darchei Teshuvah discusses at length how there are indeed more kosher types (and gives reasons as to why one cannot simply rely on that to eat any unfamiliar bird). Also, it's pretty clear that the non-kosher birds are birds of prey, and fishing birds, and other aberrant types (like ostriches and bats). They are not game birds, like pheasants and quail and partridges and chickens. 3) It is true that the chickens that have been commercially sold for the last few decades were developed with unknown types of unknown lineages. But these unknown types were all chickens! They were simply different varieties of chickens, all being the same min. Later in the manifesto, there is a section dedicated to refuting objections. 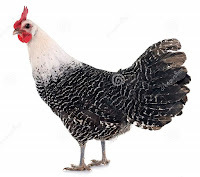 One of the objections is presented perfectly (and is entirely correct) - namely, that all chickens are descendants of wild junglefowl (genus Gallus), and are merely different mutations. The Braekel Alliance attempt to refute this in two ways. First, they claim that it is impossible for all chickens to be descended from wild junglefowl, because the Gemara in Niddah 50b (actually, they cite 2b, but it's a typo and they mean 50b) says that "wild chickens" are not kosher. But this is completely mistaken. When the Gemara says that the "tarnegol d'bra" is not kosher, this does not refer to a wild Gallus species, none of which lived anywhere close to Chazal's region. Rather, it refers to some other species of bird which shares some rough similarities to chickens. Second, they argue that the claim that all chickens are descendants of junglefowl is "nonsense" which stems from "the heresy of gentiles" - "that man was created from monkeys, and other such things - dust in their mouths!" I am not going to get into details of rebutting this. But suffice it to say that the fact of chickens being domesticated from junglefowl (in particular, the red junglefowl, Gallus gallus, with some grey junglefowl mixed in) is very well established indeed, and it only took place a few thousand years ago, not millions of years ago. Chickens are chickens are chickens. They are all descended from junglefowl. They can all interbreed. And they are all kosher. 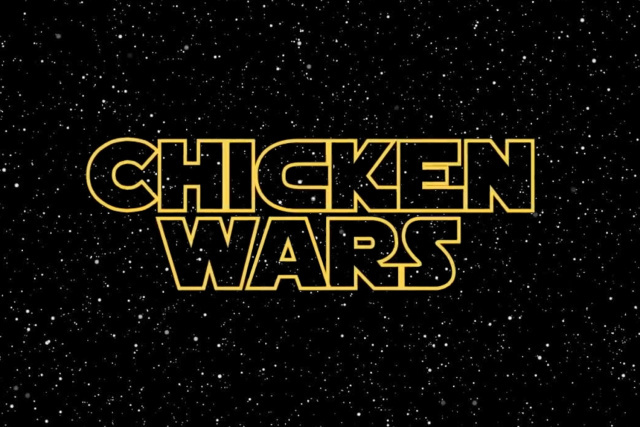 The ongoing chicken wars are astonishing in their intensity. The pashkevillim are plastered everywhere. 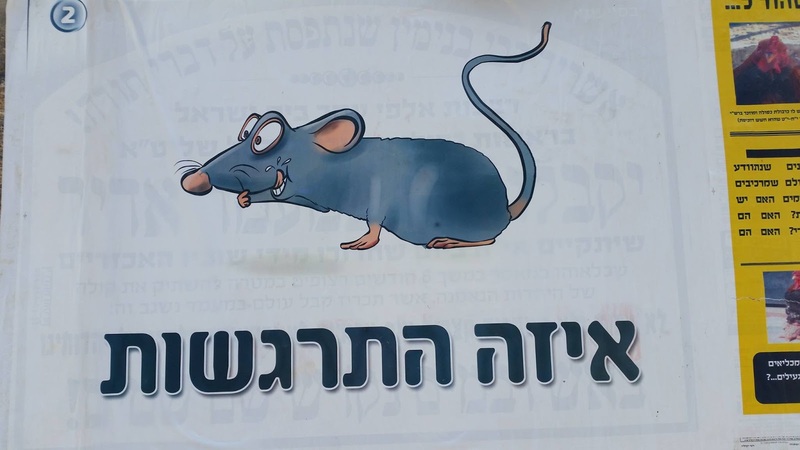 This morning I saw one screaming that Jews everywhere are eating [the equivalent of] rats! 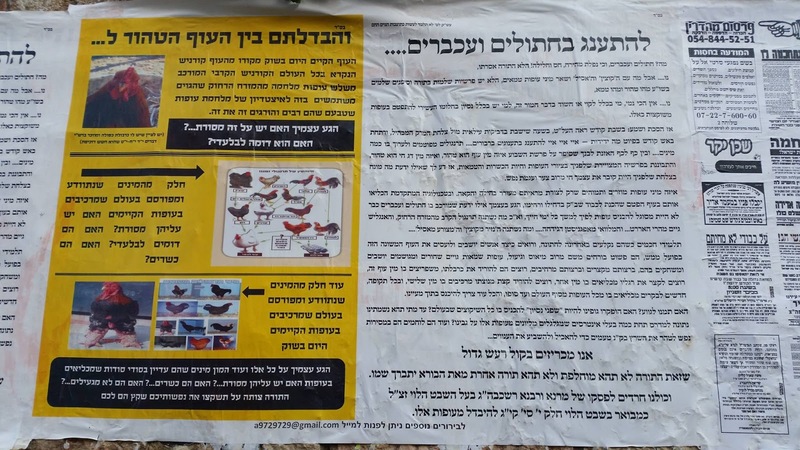 To briefly sum up the situation: Twenty years ago, Rav Shmuel Wosner expressed concern that the chickens being eaten by Jews everywhere were not the same as the traditionally eaten variety, but rather had been hybridized with birds of unknown heritage and thus potentially non-kosher. Following this, a certain group of people secretly raised huge numbers of a chicken called a Braekel, which they recently announced as being The One True Pure Chicken with no skeletons in the closet. It has received the endorsement of Rav Nissim Karelitz's Beis Din. This was accompanied with the claim that all the other chickens in the market are not properly kosher should no longer be eaten. The anti-Braekel team, on the other hand, which includes Rav Landa of Bnei Brak, claims just the opposite. They say that the existing chickens on the market are perfectly fine, whereas the Braekel has come out of nowhere, with no clear mesorah, and certain problematic aspects, and it may not be eaten. Thus, each group is claiming that their chickens are the only kosher chickens. But what is the underlying source of this dispute? If you're skeptically inclined, it's hard to ignore the massive amounts of money at stake here. The Braekel Alliance is trying to bring down the entire poultry empire, including Empire. And the poultry empire is responding in kind, striking back with the claim that not only is the Braekel not the only kosher chicken - it isn't a kosher chicken at all. With so much money involved, it's hard not to have a bad feeling about this. Still, there are definitely some halachic arguments being voiced. But they do not reflect a proper understanding of this topic. I was speaking this week with some major experts in kashrus who had some very harsh words to say about both sides, and their lack of understanding of chickens. I would like to explain why there are some fundamental mistakes being made. Before doing so, a preface: I do acknowledge that halachic reality does not always concord with scientific reality. Rav Herzog and others were of the view that one may kill lice on Shabbos even though Chazal permitted this based upon the mistaken belief that they spontaneously generate. We define hilchos bishul in scientifically inaccurate terms of kli rishon and kli sheni rather than in terms of temperature and specific heat capacity. The halachos of mar’os for a niddah are determined by poskim and mesorah rather than chemical testing. Nevertheless, it seems to me that none of that is relevant here. 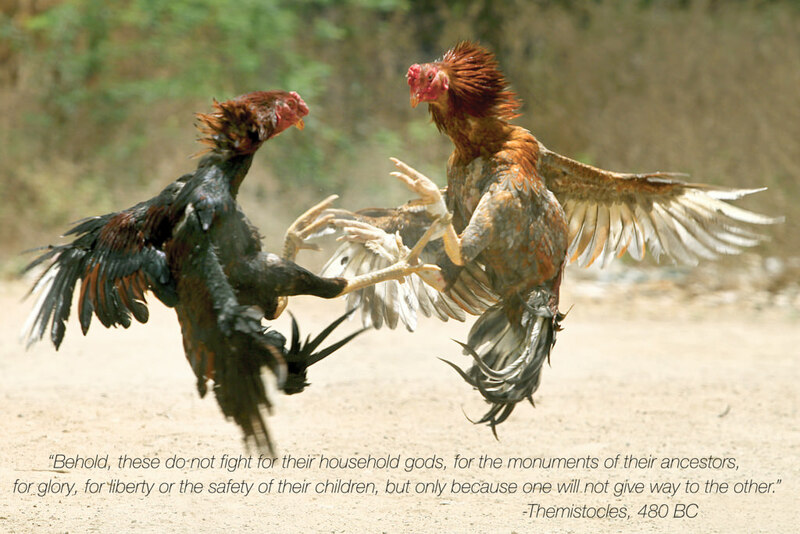 The prevalence of poskim prohibiting different breeds of chickens is due to a combination of a non-rationalist outlook with a lack of knowledge of ornithology in general and Biblical ornithology in particular. I find their arguments to be vague and unconvincing. There are two particular types of mistakes being made. (B) Many poskim do not appear to have realized/appreciated/agreed with this point. They believed that Chazal’s statements were based upon Divine inspiration, or a tradition from Noach, and that they hold absolutely true for every species in the world. (C) Thus, while many poskim say that a chicken that spreads its toes in a two-two formation is not kosher, because the Gemara says that “any bird which spreads its toes in a two-two formation is not kosher,” this is based on a non-rationalist perspective. The Gemara never meant to disqualify a breed of chicken. It was talking about owls, which spread their toes in such a manner. (A) Animals and birds of the same species can look very, very different. A chihuahua and a great Dane are both the same species. Often, tremendous variety can be produced in a few generations of selective breeding. Genetic mutations can easily trigger even features such as extra digits. (B) The zoological definition of “species” is much, much narrower than the Torah definition of “min.” There are only 24 minim of treif birds, but many, many more species of treif birds—over 400 species of raptors and owls alone! (C) It is possible to prove that birds are of the same or very similar species (which would be the same min – as above), even if they look very different, via hybridization, genetic studies, and other such techniques. (D) In general, it seems that halachic authorities did and do not appreciate the aforementioned three points. Putting all the above together, and reading the various responsa literature in light of it, it seems that many halachic authorities prohibited certain breeds of chicken because that they attributed too much significance to superficial differences, and not enough to more fundamental matters such as hybridization, genetic similarity, the history of the variety, and so on. Many people agree with me on this analysis. Unfortunately, they will not publicly say so; they are reticent to argue with famous rabbis, in case others find their lack of faith disturbing. I guess they are too... chicken. In the early days of the Lakewood Kollel, local chickens were procured for kaparos. At the conclusion of the ceremony, as the shochet came to perform the shechitah, Rav Aharon Kotler asked that the shochet stop. Baffled, the shochet inquired as to the problem. "What is that?" asked Rav Kotler, pointing to the chicken. "That's a chicken," explained the shochet. Rav Kotler replied, "In Europe, that is not how the chickens looked." The shochet pointed to one of the members of the Kollel, who, like many members of the Kollel at that time, was clean-shaven. "What's that?" asked the shochet. Surprised, Rav Kotler responded that it was a yungeleit. The shochet blurted out, "That's a yungeleit?! In Europe, that is not how the yungeleit looked." In the end, the chicken was slaughtered.